Originally posted on the now defunct VESSEL music site in 2010; my overview of La Dusseldorf’s seldom appreciated second album, ‘Viva’. Following the break-up of Neu! in 1975, founder member KLAUS DINGER along with his brother THOMAS and HANS LAMPE – both contributors to the Neu! 75 LP- went on to form the reverential Euro-traversing group La Düsseldorf. You could say that this new band was essentially a continuation of Neu! minus the contribution of MICHAEL ROTHER and production of CONNY PLANK, with the group elaborating on the main central themes and style of the much lauded Krautrock seers. Their self-titled debut was released in 1976 to favourable and critical acclaim, shifting a surprising amount of units at the time. The thin white duke himself, Bowie, called them “The soundtrack of the 80s”, before blatantly going on to marry their sound to his own, and head out on the infamous voyage of discovery in Berlin. It’s unfortunate that the bands 1978 album ‘Viva’ would be trumped, some what, by this Johnny come lately character’s own evocative ‘Low’ and Heroes’ albums of the previous year; stealing their thunder to a degree. 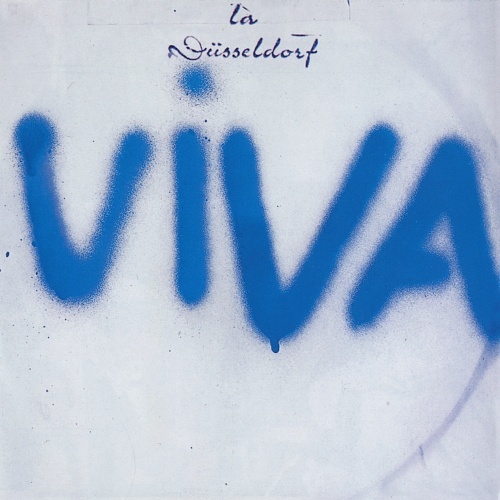 ‘Viva’ accentuates La Düsseldorf’s political concerns, mixing strident actionist manifestos with congruous sweeping layers of synthesisers, call-to-arms provocative drumbeats, proto-classical leanings and enunciated vocals, to create a sort of post-krautrock magnum opus. The shot across the bows title track sets the pace, as the Dinger brothers address an excited crowd of followers at some kind of inaugural rally. Whizzing cyclonic synths and stomping motorik Apache toms act as a platform for the chant like angst and stomp, bleeding effortlessly into the next track. ‘White Overalls’ continues the sound of protest, eulogising the utilitarian uniform of choice for the on-coming revolution, whilst evoking past political motivated movements from the Constructivists to Pete Townsend – who famously donned a pair of the titles worker clothes in the 70s to reflect his new work ethic. One of the more emotive, if not damn near elated, tracks is the instrumental pulchritude imbued lament ‘Rheinita’. Seven-minutes of indolent building layers and choral atmospherics work towards a majestic hymn that takes on elements of a more soulful Kraftwerk and a Germanic themed Vangelis. You can trace an uncanny lineage from this ethereal odyssey to the likes of both OMD and Joy Division. There is a frowning vitriolic attack on the evils of money and wealth on ‘Geld’, an ode of contempt set to a backing of punk and lampooned glam rock, that also carries a melody not too dissimilar to The Hitchhikers Guide To The Galaxy’s theme tune. Bouncing between dialects, they sing, “Cash is the trauma of the world”, and “Cash governs the world my friend”. There’s even a sly dig at The Beatles, our troupe mockingly sighting the slogan of, “Love is all you need” in pious irony. Side two is wholly occupied by the twenty-minute anthem ‘Cha Cha 2000’, a utopian list of demands and mantras that run over a four act musical suite of pulsing drums, driving bass and empyrean sound-scapes of synthesised euphoria. This joyful and triumphant march channels all the most vehement and stirring examples of German music from the last century into one outpouring of sublime adulation. La Düsseldorf grabbed back their very own sound from all the imitators to produce an uplifting near-futuristic European soundtrack, set against the bleak reality of the late 70s.Flipping from their own native tongue to a toss-up between both French and English, they really tried to express a universal sound and agenda; though it must be said that a bunch of blue-eyed, blond Germans spouting ideals could be conceived as just a tad ironic. They would never manage to top this their second album, skulking back into the shadows to write more ambient inspired pieces during the very decade when they proved most influential. ‘Viva’ is a forgotten treasure that is due some kind of renaissance and reappraisal.